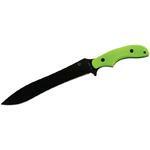 KA-BAR ZK Knives Famine Tanto Fixed 7-5/8" Black Plain Blade, Green and Black Interchangeable Handles Included. In an ever-changing world, the need for preparedness has never been greater. Without notice the game can change and the rules no longer apply. Questioning your gear at a crucial moment is not an option. Whether setting up camp or securing your perimeter, ZK knives are designed to perform under the most rigorous, unexpected and apocalyptic situations. Are you prepared? 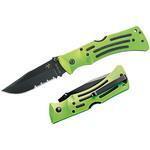 All full-size ZK knives are mounted with green handles (as shown in main image above) and include an extra set of interchangeable black handles. The shipping was super fast- I received my two knives in under 4 days- yes, I bought two of these, one for myself and one for a good friend. Upon opening it, I was honestly surprised at how hefty this knife turned out to be. I already owned the machete from this ZK line, and this tanto was no lightweight even next to it. It was razor sharp right out of the box, and even the little side-knife that came with it was very sharp. For the price, you get two knives, a very useful and heavy duty sheath with pouch, cords and extra scales- it's a very good deal indeed.My only complaint is that since a tanto is a stabbing weapon, this knife should have a more pronounced guard to prevent hand from slipping forward especially if the hilt is wet. As it is currently it actually makes a much better chopper than stabber. i have been looking at this blade for a long time and was happy to see it on your site and at a great price the free ship made this a no brainer it would have cost me 20 to 30 more were in san diego. so thanks for having a great line on knifes to chose from. i need to look around for more good deals on the wish list. thanks bob. 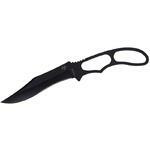 Hey, I wanted to share "KA-BAR 5700 ZK (Zombie Killer) Knives Famine Tanto Fixed 7-5/8 inch Black Plain Blade, Interchangeable Handles" with you from KnifeCenter.